The rotator cuff is a group of flat tendons which fuse together and surround the front, back and top of the shoulder joint like a cuff on a shirt sleeve. These tendons are connected individually to short, but very important muscles that originate from the shoulder girdle. When the muscles contract, they pull on the rotator cuff tendon, causing the shoulder to rotate upward, inward or outward, hence the name "rotator cuff". The shoulder is a ball and socket but, unlike the hip joint the socket is very shallow. This allows great mobility but the capsule and its surrounding rotator cuff must be in good condition to hold the surfaces together throughtout its range of movement. The uppermost tendon of the rotator cuff, the supraspinatus tendon, passes beneath the bone on the top of the shoulder, called the acromion. In some people, the space between the undersurface of the acromion and the top of the humeral head is quite narrow. The rotator cuff tendon and the adherent bursa, an envelope of lubricating tissue, can therefore be pinched when the arm is raised to shoulder level causing a sharp pain. With repetitive impingement, the tendons and bursa can become inflamed and swollen and cause the painful situation known as "chronic impingement syndrome". 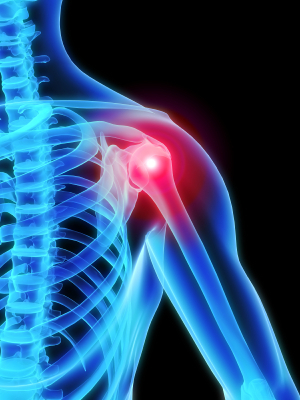 Referred pain, or more of a dull ache, is often felt down the arm between the shoulder and the elbow. Not infrequently this can cause pain at night and sleep disturbance, particularly if you lie on that side. When the rotator cuff tendon and its overlying bursa become inflamed and swollen with impingement syndrome, the tendon may begin to break down near its attachment on the humerus bone. With continued impingement, the tendon is progressively damaged, and finally, may tear completely away from the bone. These tears can result from relatively trivial injury such as pulling a rope on a lawn mower or a boat but equally can result from a more dramatic trauma such as a fall when skiing. There are many factors that may predispose one person to impingement and rotator cuff problems. The most common is the shape and thickness of the acromion (the bone forming the roof of the shoulder). This can make it more likely to impinge on the rotator cuff when the arm is elevated to shoulder level. Activities which involve elevation of the arm to shoulder level may put an individual at higher risk for rotator cuff injury. Unfortunately, when we enter our forties the blood supply to the "critical zone" in the rotator cuff tends to fall away and the slightest injury to this region becomes compounded by another insult before it has time to recover (as healing is all about the quality of the blood supply). A similar situation can afflict the Achilles tendon - rupture is uncommon below mid-thirties and typically occurs where the blood supply is poorest (about an inch above the insertion into the heel bone). 5. Other than impingement what else can cause rotator cuff damage? In young, athletic individuals, injury to the rotator cuff can occur with repetitive throwing, overhead racquet sports, swimming or working against resistance ina gym. This type of injury results from repetitive stretching of the rotator cuff during the follow-through phase of the activity. The tear that occurs is not caused by impingement, but more by a joint imbalance. This may be associated with looseness in the front of the shoulder caused by a weakness in the supporting ligaments. The most common complaint is aching located in the top and front of the shoulder, or on the outer side of the upper arm between the shoulder and elbow. The pain is usually increased when the arm is lifted to the overhead position. Frequently, the pain seems to be worse at night, and often interrupts sleep. Depending on the severity of the injury, there may also be weakness in the arm and, with some complete rotator cuff tears, the arm cannot be lifted in the forward or outward direction at all. The diagnosis of rotator cuff tendon disease includes a careful history taken and reviewed by the surgeon, an x-ray to visualise the anatomy of the bones of the shoulder, specifically looking for the narrowing of the space over the joint. Physical examination is most important. Loss of muscle bulk may be present, along with weakness, if the rotator cuff tendons are injured. Special impingement tests can suggest that impingement syndrome is also involved. An MRI (magnetic resonance imaging) scan frequently supports the clinical diagnosis on the status of the rotator cuff tendon but this may not be necessary if the patient is in sufficient pain to warrant an arthroscopy (key-hole surgery) in any event. If minor impingement or rotator cuff tendonitis is diagnosed, a period of rest coupled with medicines taken by mouth, and physiotherapy will frequently decrease the inflammation and restore the tone to the atrophied muscles. Activities causing the pain should be slowly resumed only when the pain is gone. Sometimes a steroid injection into the bursal space above the rotator cuff tendon is helpful to relieve swelling and inflammation. Application of ice to the tender area three or four times a day for 15 minutes is also helpful. If there is a thickened acromion or acromial bone spur causing impingement, it can be removed with a burr using arthroscopic visualisation. This procedure can be performed as a day case, and at the same time, any minor damage and fraying to the rotator cuff tendon and scarred bursal tissue can be removed. Often this will cure the impingement and prevent progressive rotator cuff injury. An overnight stay is often advisable, particularly in the presence of stiffness as this allows us to monitor the discomfort and mobilise the shoulder earlier and more effectively. When the tendon of the rotator cuff has a complete tear, the tendon often must be repaired using surgical techniques. The choice of surgery, of course, depends on the nature and appearance of the tear, and the functional requirements for that shoulder. In young working individuals, repair of the tendon is most often suggested. In some older individuals who do not require significant overhead lifting ability, surgical repair may not be as important. 11. What will happen if a torn rotator cuff is not repaired? In some situations, the bursa overlying the rotator cuff may form a patch to close the defect in the tendon. Although this is not true tendon healing, it may decrease the pain to an acceptable level. If the tendon edges become fragmented and severely worn, and the muscle contracts and atrophies, repair at that point may not be possible. Sometimes in this situation, the only beneficial surgical procedure would be an arthroscopic operation to remove bone spurs and fragments of torn tissue that catch when the arm is rotated. This certainly will not restore normal power or strength to the shoulder, but will often relieve pain. 12. 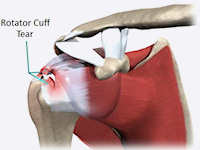 How is major injury to the rotator cuff tendon repaired surgically? Using the arthroscope at the beginning of the case allows visualisation of the interior of the joint to facilitate trimming and removal of fragments of torn cuff muscle and tendon. The next step utilises the arthroscope to visualise damage to the ligament beneath the acromial bone, this and a small sliver of bone can be removed with a radiofrequency probe and miniature cutting instruments. If it is necessary to suture a rotator cuff tear which has pulled off the bone this can usually be performed arthroscopically but it may be necessary to perform a small additional incision. Following arthroscopic surgical decompression for impingement, the shoulder should be mobilised immediately as pain allows. IT IS VERY IMPORTANT THAT YOU REGULARLY AND FREQUENTLY VISIT THE LIMITS OF MOVEMENT - SLOWLY AND PURPOSEFULLY - IN ORDER TO AVOID STIFFNESS AND THE ASSOCIATED PERSISTANT DISCOMFORT FROM ADHESIONS. The tendency to stiffen up is maximal in the first four weeks following surgery. It is often helpful to take your anti-inflammatory pain killers regularly as this will help you keep the shoulder supple. If a full thickness tear of the rotator cuff was present and repaired, then the shoulder will be supported by a polysling. This is very helpful because it will allow exercise of the elbow, wrist and hand at all times, and places the arm in a position that promotes better blood circulation and relieves stress on the repaired rotator cuff tissues. 14. What is the rehabilitation after rotator cuff surgery? Depending on the type of surgery performed you will need to allow time for healing and regaining the full range of motion. Only once this is established is it necessary to strengthen the shoulder muscles. Rarely is shoulder surgery a "quick fix". With impingement syndrome it can sometimes take two to three months but recovery and outcome is strongly correlated to the extent of the damage at the time of surgery. 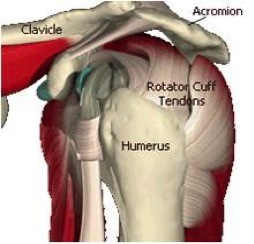 If the rotator cuff tendon has been completely torn, it may take up to six months. Frequently, pain relief is much quicker and return to daily activities is often possible much sooner. Again, every case is unique. In the young, healthy person with a minor rotator cuff impingement, surgery is predictably successful. As the injury becomes more severe and the blood supply is poor, irreversible damage may have occurred and a perfect result cannot be expected. Despite this, pain relief and return of strength are usually well worth the post-operative discomfort and protracted recovery. The final outcome often depends on the willingness and ability of an individual patient to work on their post-operative physical therapy programme.